Julie, I love and admire this window into your world, your history, your heart and–hallelujah–your healthy brain. What an honoring account of your parents and their contributions to your creative/writer self. Your voice is compassionate and generous. SUBDURAL promises to be captivating. On Monday, March 25th, I met with the Women Who Write at Carol Bluestein’s house. 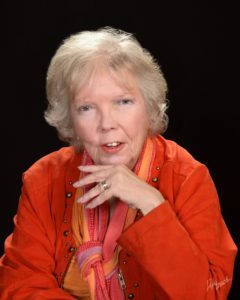 The group began as a “kitchen table” offshoot of the International Women Writers Guild, and most of us are members, although that’s not required. Attendance fluctuates, usually with four to six women present—an ideal size for sharing generous samples of our works in progress, then receiving feedback if we so desire. Each writer specifies the type of feedback she wants, whether it’s a detailed critique or a simple affirmation like “It’s great you’re writing—keep up the good work.” The one rule is that we accentuate the positive. 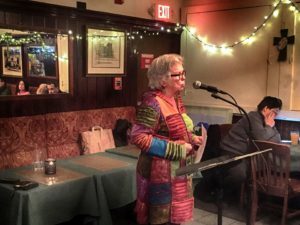 That night I was off to Poets Speak Loud, an open mic sponsored by Albany Poets and held at McGeary’s, an old-timey pub. Proprietor Tess Collins reserves the back room for a motley crew of poets ranging from late teens reading from their smart phones to octogenarians reading from published books. 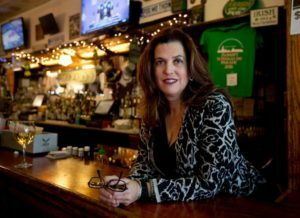 Mary Panza usually hosts, and the atmosphere can be raunchy and politically incorrect. (That Monday night Dan Wilcox read a new poem about masturbating while sitting on his back porch reading Mary Oliver.) No matter the quality or content of what’s read, every poet’s performance is greeted with enthusiastic cheers and applause. I read excerpts from SUBDURAL at both gatherings. With the Women Who Write, I shared the first draft of the Introduction. “If you were an agent reading this as part of a proposal,” I asked, “would it grab you? Would you want to see more?” Yes, they said, they would. Then they shared some unsolicited but helpful opinions about the structure and content of what I’d written. McCarthy in the underground tram that links the Capitol and office buildings in Washington D.C., and “My Mother’s Head” is a work in progress about my mother’s head injuries, including the subdural hematoma that ultimately killed her. Not exactly jolly, but the other poets gave me the attention and applause I craved. I love the local poetry scene because it offers so many opportunities to get positive reinforcement. There’s an open mic happening somewhere practically every day, at libraries, book stores, art centers, coffee houses, bars. The best place to learn about them is at Albany Poets. 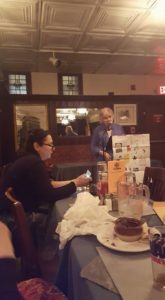 Thom Francis, who happens to be my web designer, keeps www.albanypoets.com updated weekly, with links to the venues that offer further information. Geographically, they range far beyond Albany, with New Paltz and Woodstock to the south and Saratoga to the north. Atmospherically, they range from quiet and contemplative to boisterous and rowdy. My own preferences rise and fall on the spectrum, depending on my mood, but I lean strongly toward events where booze is involved. 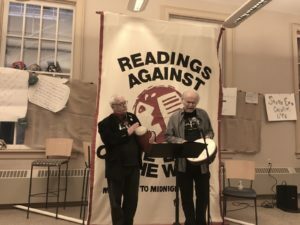 To kick off the 2019 Word Fest Albany Poets and the UAlbany Writing Center are presenting Readings Against the End of the World, a 24-hour read-a-thon to benefit the South End Children’s Cafe. All word-lovers and writers are invited to share readings – original work or favorite passages, poems and rants, raps and stories, spoken word and personal visions- enough to fill twenty-four hours the power of words. The event will begin on Friday, April 12 at the Husted Hall Café on the UAlbany Downtown campus, and will continue until Saturday, April 13. At this writing, there are plenty of spots still available—it takes a lot of people to fill 24 hours with words. Why not come down and share something of your own? If you suffer from stage fright, you can read during the wee hours after midnight, because the audience will get smaller with each passing hour. Visit www.albanypoets.com to sign up and to read about the many other events happening during Word Fest. I hope to see you there!